Richbrook Anodised Aluminium 'twist-off back' tax disc holder. Richbrook Chrome Poppy Coral air freshener. 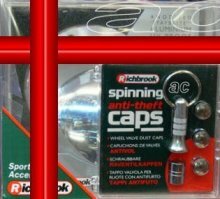 Richbrook Anodised Aluminium anti-theft valve caps. 1 Chrome Poppy Coral Air Freshener, Size 11cm x 8cm. Bright Anodised Aluminium valve caps with anti-theft locking feature. Genuine Anodised Aluminium Richbrook tax disc holder. 1 Anodised Aluminium tax disc holder.